Whether you are a musicophile or a casual listener, this Android music player that we’re presenting to you today will surely enhance your listening experience. It’s called Wired, compatible with both phones and tablets, designed with sleek and elegant user interface. Although the app is free for download, it offers many features that will improve your music listening experience. Wired is full of well-packed features, all free and simple to use. The app is suitable for anyone, it will suit your needs no matter what music you love listening to – whether you’re a casual music listener or a die-hard music lover. 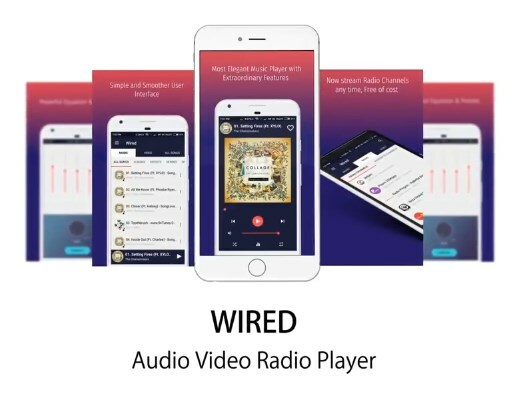 We say it is an all-in-one app because it provides with a powerful equalizer music player, a great video player, and a radio player as well (integrated with shout cast radio channels). Listen to music, play videos and switch to radio channels with an ease. Simply navigate through its features and choose what you like. Create music playlists, manage your tracks, select songs by artist, album, genre, most played and favorite, choose from multiple colors to customize the player, browse through different radio channels, and so on. In addition, the app offers a powerful 5 band equalizer for more professional sound, higher volume and better quality. Download this extraordinary and quality player app for free from the following Google Play link and enjoy an improved music experience on your Android phone or tablet.